Wystan Hugh Auden was born in York, England in 1907, moved to the United States during his childhood and was educated at Christ Church, Oxford. As a young man he was influenced by the poetry of Thomas Hardy, Robert Frost, William Blake, Emily Dickinson, Gerard Manley Hopkins, and Old English verse. His first collection Poems was privately published in 1928, then in 1930, his second book, also titled Poems (with different verses) was published and brought his work into the limelight, drawing him into the leadership role of the generation. W H Auden was known for his versatility, his ability to write any theme and any form. He was highly prolific and very little escaped the attention of his pen. He was known to mimic the writing styles of other poets and to use his verse to journal life experiences and travels. In addition to his impact on poetry, Auden was a noted playwright, librettist, editor, and essayist. Generally considered the greatest English poet of the twentieth century, his work has influenced succeeding generations of poets around the world. He was a Chancellor of The Academy of American Poets from 1954 until his death in 1973. 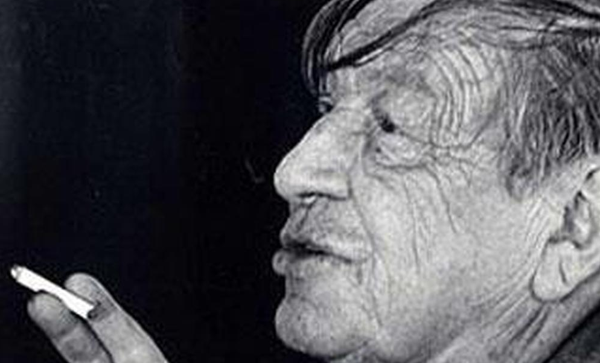 I selected one poem by W. H. Auden to share with you for two reasons. Although it appears to be long, the rhythm pulls the reader along and the length disappears. As I read, almost each individual verse could easily be presented as poem by itself. Auden’s unusual writing style has been the subject of contemplation and debate. Most believe he was strongly influenced by the social climate of his childhood with his verse mimicking the vernacular shared between childhood friends. If so, he succeeded in presenting poetry in language and metaphors that surpass place and time. I’m Beth Winter and I thank you for joining me for Pretzels & Bullfights. I hope you enjoyed this little peek at the poet W. H. Auden. Informative and enhanced by your perspective and choice of poem. The social climate that you refer to becomes clearer when you consider his participation in, and strong vocal support for, the Republicans in the Spanish Civil War. Thank you for this well-written essay. Thanks so much, Beth. One of my favorite poems by one of my favorite poets. k.
I have never been a great reader of mainstream poetry, and I had not heard of this fella. But, reading his poetry here has set me on a road t odiscover more about the man and his works and seldom does that happen. So I guess I have a new challenge now and although I would not try to emulate the man, I really do connect with his style very easily. Thank you for drawing my attention to a poet I do not know, but one I am sure I will come to greatly respect. I did enjoy your post. He was a wonderful poet! Thank you, Beth, I enjoyed it very much! I didn’t really know much about him before this, but I do love his style, and you are right, his work does surpass place and time. Kelly, those two lines have been toying with me all day. So pleased you enjoyed it. Not only was W.H. Auden a gifted poet in his own right, but he also encouraged other gifted poets. At the moment I am reading a book of Louis MacNeice’s poems, published by Faber and collected by Auden. Thanks for the brief biography, Beth – and for includinone of Auden’s poems. I enjoyed both. nice beth…i really do like his style…i like the speculation as well around his writing in childhood language as i find the way he writes very captivating….and def the journaling life experience is right up my alley…smiles. Thanks for Auden today! Now that I am writing more, I am reading less, so to come here and be reminded of why I know a poet’s name is great! Good choice. W H Auden is one of my favourite poets, he taught in a local school in Worcestershire and regularly walked the Malvern Hills. His poetry is true inspiration. Thank you, Beth, for writing about this marvellous man. Thanks Polly. I am fascinated by his work. So pleased you enjoyed it. Thank you Beth. I enjoyed this poem a lot. I may have to investigate his writings further. Wonderful post. Thanks, Beth. A friend of mine, a former Eng. Lit. professor, currently Education Curator at NV Museum of Art, named his daughter Auden! I never knew too much about him before this! A favorite poem by one of my all-time favorite poets. Thanks so much for sharing! So pleased you enjoyed. I love his work. Thank you for Auden ‘s poem, reminder for many of us, In headaches and in worry/ vaguely life leaks away, and the futility of such activity for eventually time will have his fancy. A very Buddhist sentiment. Auden’s amazing! Lovely to be reminded of his great poetry. love love love the rhythm the rhymes and the almost simple ,naieve concepts…my kind of poet! Beth, this was a real treat. I have always known much more of is life than his poetry. Time to go to my library and pull out his work. Thank you for a wonderful presentation. Thank you, Beth. I will read this poem several more times today, enjoying it more each time. Thank you 🙂 A wonder!! !-ful poem from a wonderful poet.